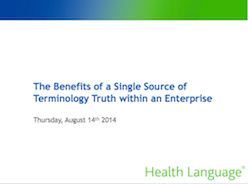 Do you have a single source of terminology truth? If not, you should. This Webinar led by Tom Winchell of Dean Health, and Brian Levy, MD, Vice President of Global Clinical Operations with Health Language, will discuss how having a set of current, approved, up-to-date terminologies, maps and value sets can help power interoperability, increase efficiency, and reduce administrative overhead for an organization. To download the webinar and slides, please fill out the form to the right.